In 1950, when Nat Fleischer published his listings of the all-time best fighters in each weight class, he ranked Joe Walcott as the greatest of the welterweights. Walcott was a tough, skillful fighter willing to take on all comers from welterweight to heavyweight. Not quite 5'2", Walcott was nevertheless powerfully built and had a long reach that allowed him to compete with much larger men. He had great stamina and withstood beatings that would have finished most fighters. Born in Barbados, Walcott grew up in his family's adopted home of Massachusetts. Although not a street brawler, Walcott excelled in both boxing and wrestling. While working as an elevator operator in a Boston hotel, Walcott began his professional career under the direction of promoter Tom O'Rourke. He won his first fight with a second-round knockout of Tom Powers. After tallying 36 victories in 49 fights, including 21 wins by knockout, Walcott faced Kid Lavigne in San Francisco in 1897 for the world lightweight title. A natural welterweight, Walcott was weakened by the necessity of making the lower weight limit. Lavigne retained the title with a twelve-round decision. Walcott scrapped with Mysterious Billy Smith for the welterweight title in 1898. Smith and Walcott always put on a good show and they fought for 20 anything-goes rounds with the win going to Smith. In 1900, Walcott knocked out Joe Choynski, the heavyweight who went on to vanquish Jack Johnson the next year. A few times in his long career, Walcott was forced to throw a fight. In a bout with Tommy West, Walcott, who was boxing well, simply quit at the end of the eleventh round. O'Rourke later told Fleischer, "Walcott didn't dare to win that night. I got the tip . . . he must lose. . . . If West had been stopped in that twelfth round . . . I'd probably have been laying nice, peaceful and natural on the next slab." Walcott was given another shot at the welterweight title in 1901 when the fought Jim ("Rube") Ferns. Walcott won easily with a fifth-round knockout. He retained his title until 1904, when he lost on a foul in the twentieth round to the Dixie Kid in the first world title match between two blacks. When the Dixie Kid outgrew the welterweight class later that year, Walcott was unofficially considered to have reclaimed the title. In 1906, Honey Mellody won a fifteen-round decision over Walcott to become the new welterweight champ. 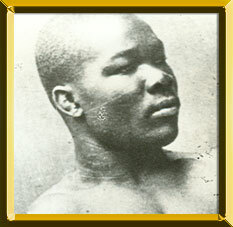 Walcott held his own against much larger fighters, such as Sam Langford and Philadelphia Jack O'Brien. In addition to his recorded bouts, Walcott is reputed to have fought many other times. He retired in 1911 at the age of 38. In retirement, he worked as a fireman, a porter on a freighter, and as a handyman at Madison Square Garden. Jimmy Walker, then Mayor of New York, is said to have interceded with Garden officials to obtain this job for the down-and-out fighter who had once been a star. Walcott died in 1935 when struck by a car in Massillon, Ohio.